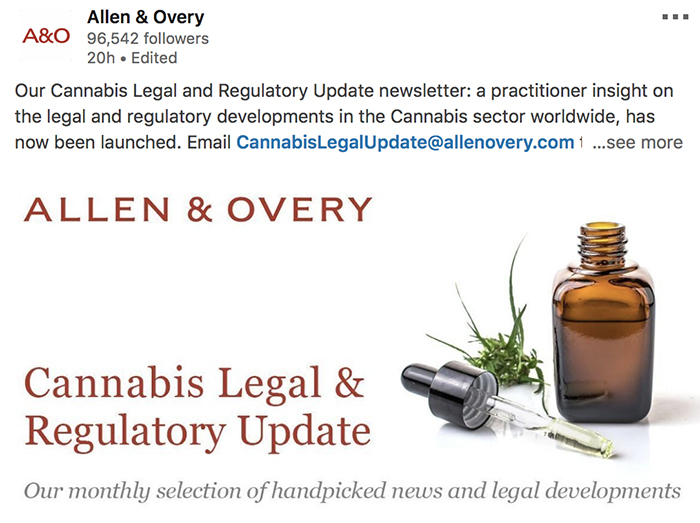 Megafirm Allen & Overy is touting for business in the legal cannabis market, with its cannabis law team launching a new “legal and regulatory update newsletter” yesterday. A post on the firm’s LinkedIn page (screenshot below) yesterday promised clients “a practitioner insight on the legal and regulatory developments in the Cannabis sector worldwide” in a new monthly newsletter. The cannabis page on the Allen & Overy website points out that the global market for the increasingly legal substance is worth approximately $150 billion (£116 billion), with that figure getting higher year on year. The firm has “built a multidisciplinary group focused on the cannabis market”. It offers advice from lawyers “who understand the specific sector and the particular challenges it may bring (including reputational issues)”. 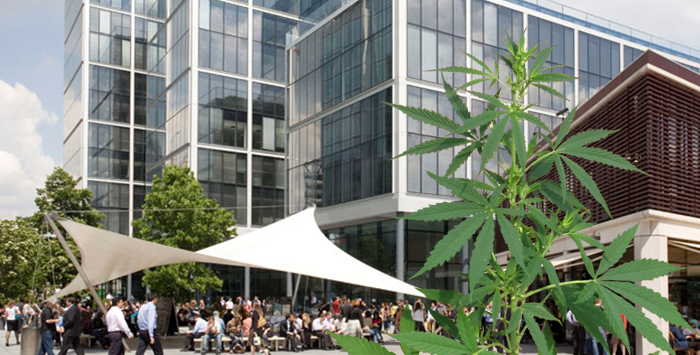 Allen & Overy is thought to be the first magic circle firm to target the budding cannabis law market in this way, although smaller outfits have also spotted its potential. DAC Beachcroft boasts of its expertise in medical cannabis and was the legal sponsor of a recent Cannabis Invest UK event. The move comes as criminal bans on cannabis are being relaxed around the world, replaced by strict regulations. A&O says that more than 25 countries now permit its medical use. Canada recently became the first major country to legalise the substance, along with many US states. A new Netflix hit, Murder Mountain, documents the rocky road to regulated cannabis production among formerly illegal growers in the wilds of northern California. Cannabis remains illegal for recreational use in the UK. Last year, Labour leader Jeremy Corbyn suggested that possession of the Class B drug could be decriminalised, but stopped short of calling for its legalisation. Following a recent change in the law, cannabis-based medicines can be prescribed by British doctors in limited circumstances where all other treatments have failed. I hope to see similar developments around the MC. Lawyers use cocaine, not weed. Yeah, I am speaking for myself. All my friends too. No joke this is actually my dream practice area. How do I qualify into cannabis? And which other firms should I target? Tokes & Gray are a top firm in this area. Blazer Mills are known for their expertise. We have long supported our clients in this area from our top, top HQ in LA. Light up, turn on, tune in.